The Informe.com project was initially limited to forums hosting, but due to user demand, blog hosting and wiki functionality were added. Users then began requesting a special photo gallery mode to enhance the forums so we looked around for options and came across Gallery. After just enabling it as a forum addon, it became very popular and we decided to transform it into separate component from the forum, blogs and wiki. Thanks to your project's excellent structure we have implemented it quickly and easily, and in the past few weeks we have seen a large number of new portals with Gallery as the main component. Gallery completes our offerings so now millions of Informe users are able to create their own smart information portals and explore all of Gallery's advantages. Are you using Gallery for something unique? Let us know by e-mailing us! Making Money with Digibug and Gallery 2. Digibug, one of our photo printing affiliates, is offering some limited time deals for Gallery users. Below is their story about their service and their current promotion! Gallery has had shopping cart support for prints for a while now, but did you know that Digibug allows you to set your own prices and keep most of the profit? Digibug has been providing a profit-making e-commerce solution to the Gallery community for the last two years – giving thousands of dollars in profits to Gallery administrators. Read more to learn how other Gallery users are making money with Digibug, and about our 100% Profit Promotion. Just in time for the holidays, Gallery 2.2.4 is now available for download. This release fixes critical security issues, no new features have been added. Due to the severity of these issues users of all previous Gallery 2 versions are strongly encouraged to upgrade to version 2.2.4 as soon as possible! All issues addressed in this release were discovered through an extensive internal security audit. Since 2.2.4 is a security release, it shares the same installation requirements as 2.2.3. If you haven't upgraded to 2.2.x yet, please review the Gallery 2.2 release notes for highlights of changes and the requirements. Read on for more details and upgrade instructions. In an effort to centralize Gallery integration projects, you can now find documentation and dedicated forums for integrations on our website. 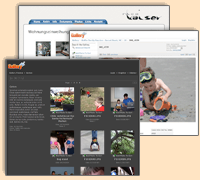 While the new integration forums and the new home for documention of integrations are already in place, we are still busy importing the existing forum discussions and documentations from the old integration websites, like www.galleryembedded.com. This summer, the Gallery project participated in the third Google Summer of Code. The Summer of Code is a program, funded by Google, to essentially give students a paid internship with Open Source projects. At the end of August, the third Summer of Code completed successfuly, not only for Gallery, but each of the 130 other mentoring organizations. Gallery 2.2.3 is now available for download. This release adds no new features. It fixes critical application security bugs in the WebDAV and Reupload modules. If the WebDAV or Reupload modules are active in your Gallery we strongly recommend that you either disable them, upgrade them via Downloadable Plugins or perform a complete upgrade to version 2.2.3. Thanks go to Merrick Manalastas and Nicklous Roberts for reporting the issues to the Gallery Security team! Gallery 2.2.3 is a small security upgrade from 2.2.2 and has the same requirements as 2.2.2. If you haven't upgraded to 2.2.x yet, please refer to the release announcement of Gallery 2.2 for highlights of changes and the requirements of the Gallery 2.2 release.